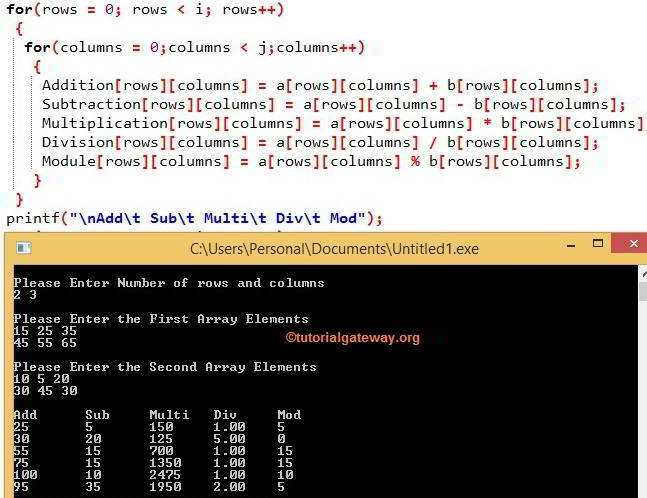 In this article we will show you, How to write a C Program to Perform Arithmetic Operations on Multi-Dimensional Arrays with example along with detailed explanation. This C program allows the user to enter the number of rows and columns of 2 Two dimensional array and then we are going to perform the Arithmetic Operations such as Addition, Subtraction, Multiplication and Division on Multi-Dimensional Arrays. In this Program, We declared 2 Two dimensional arrays a, b with the size of 10 * 10 and we also declared 4 more Two dimensional arrays Addition, Subtraction, Multiplication and Module of integer type and 1 Two dimensional array Division with float data type because, division of 2 integer numbers may give float results in most of the times. Below scanf statement will assign the user entered values to i and j (Rows = i and Columns = j). The value of column will be 0 and the condition (columns < 2) is True. So, it will start executing the statements inside the loop until the condition fails. After the increment the value of columns will be 3 and the condition (columns < 3) will fail. So it will exit from the loop. The value of column will be 0 and the condition (columns < 3) is True. So, it will start executing the statements inside the loop until the condition fails. Now the value of rows will be incremented, it means rows =2. Condition (rows < 2) will fail So, it will exit from the loop. Will traverse as we explained above but instead of summing it will display the values one by one using the printf statements inside them.